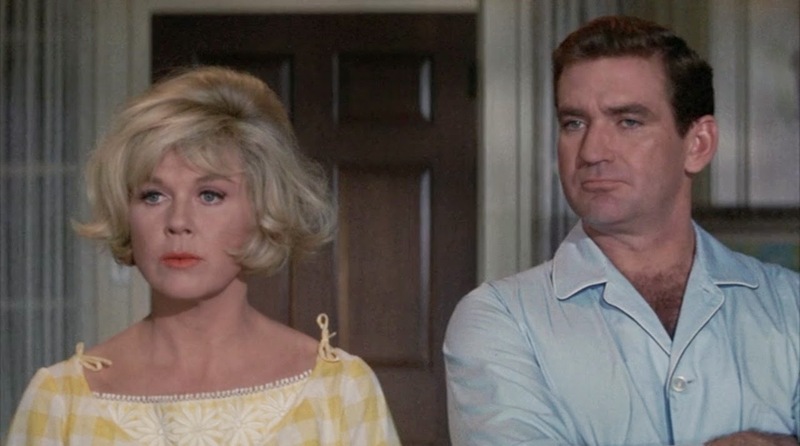 A lame romantic comedy, Do Not Disturb suffers from manic over-acting by Doris Day and an almost total absence of chemistry between any of the couples on display. American businessman Mike Harper (Rod Taylor), an executive with a wool fashions and textile company, is relocated to England and asked to breathe life into the failing European side of the business. His wife Janet (Day) insists that they live in a country house in Kent, a long train commute away from Mike's London office. He starts to spend more and more time at his firm's apartment, and in the company of his attractive assistant Claire Hackett (Maura McGiveney). Back in Kent, the town's busybody Vanessa Courtwright (Hermione Baddeley) convinces Janet that she needs to arouse Mike's jealousy by pretending to have a lover of her own, and arranges for suave antique furniture dealer Paul Bellari (Sergio Fantoni) to be the pretend lover. But Paul has plans of his own, and whisks Janet away to Paris on a quest for some furniture pieces - and possibly some romance. Directed by Ralph Levy, who spent almost his entire career in television, Do Not Disturb is a second rate production which never gets going, and is a lot more annoying than funny. Doris Day unleashes all the loud ditziness with none of the seductive cuteness, pushing her persona to intolerable levels of aggravation.The character of Janet is an insufferable dimwit bouncing on the energy of her cluelessness, and it's a wonder that the Harpers have any kind of a marriage to care about or save. There is not a hint of warmth between Mike and Janet, while Janet spends most of the interminable Paris trip drunk out of her mind, eliminating the potential for serious romance with Paul. The most dangerous woman on show is Claire Hackett, who has all the icy attributes of an expert home wrecker, but the screenplay by Richard Breen and Milt Rosen gives her next to nothing to do. Not all is completely lost, as the film reaches a climax at a business conference attended by all the textile industry magnates with curvy "assistants" rather than their wives. Janet crashes the event to try and reclaim her husband. Levy finally finds some good laughs on a dance floor filled with older men behaving badly, younger dolled-up mistresses vying for their attention by shaking their assets, an orchestra smoothly switching tunes according to who is on the dance floor, and catering staff navigating the flailing limbs with consummate skill. It's a party that would have been worth attending, unlike the rest of this feeble film.